As we approach the 30th anniversary of West Ham’s best ever league finish of third back in 1986, much will be made of the squad and their success. Perhaps one of the lesser known names that spring to mind from that squad is central defender Neil Orr. The son of a footballer, Orr was always likely to follow in his father’s footsteps and made his debut for hometown club Greenock Morton in 1975 when he was just 16. Orr made 186 appearances in the Scottish leagues for Morton and represented the Scotland at youth level as well. Neil Orr cost John Lyall and West Ham £400,000 when he joined the club in January 1982, after being recommended by club icon Ray Stewart. He featured heavily in the first team right away, making his debut in the claret and blue in a defeat away to Manchester United and scored his first goal not long after that in a 2-2 draw at home to Birmingham City. His first full season, however, did not go as smoothly. Orr suffered injuries that interrupted his year, especially after Christmas where he featured mostly as a substitute, starring in just 14 games across the season. Another notable game he took part in was West Ham’s record victory, a 10-0 drubbing of Bury in the 1983/84 League Cup. Orr actually scored in the first leg of that tie in a les remarkable 2-1 victory. Neil Orr had a key part as a member of the 1985/86 squad. He played 36 games in the league as West Ham still had a chance of the title entering the final day before defeat to Everton. Often wearing number 11 this year, Orr netted twice during the season. The first was in a 4-0 win over West Bromwich Albion and the second was in the 8-1 win over Newcastle United, a game remembered more for Alvin Martin’s unique hat trick. It was a very special season for everyone at the club and also saw Orr’s highest league finish of his career, whichever club he played for. Orr played just one more season for West Ham after that, starting well but again suffering injury, playing only twice in the last few months he had in East London. His last goal for the Hammers came in a 2-2 draw away to Sheffield Wednesday. West Ham were the only English club Orr played for, as in August 1987 he moved back to Edinburgh to play for Hibernian. He was there for five years before retiring after a single season at Queen of the South. Orr played 146 league games for the Irons, all in the top division, scoring four goals in the process. In total, he made 175 appearances, netting on five occasions. Since his retirement, Orr has remained in football, primarily coaching youth players. For a period he did this in the United States before returning to Scotland as a youth development officer with the Scottish FA. 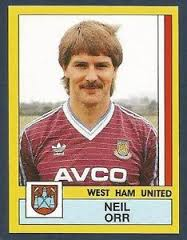 Neil Orr was an integral squad member for five years at West Ham United and will always be known as one of the ‘Boys of 86’. Please comment on my article and suggest any other players from the past that you would like me to research.